This campaign ended on April 26, 2017, but you can still make a gift to University of Indianapolis by clicking here! Kory Vitangeli gave $125 because 125 donors made a gift in 1 day. Help us reach our goal of 425 donors by sharing your personalized link (see Advocates tab) with family and friends. When you generate one donation, you will receive a handwritten thank you note from a current student. 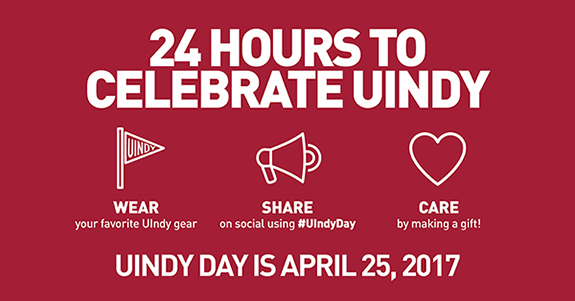 Become an Advocate by spreading the word about #UIndy Day. When you generate five or more donations, we will send you a UIndy alumni decal. Click the 'Advocates' tab to get started. The first two people to generate five donations will receive a free tailgating spot at any 2017-2018 UIndy football game. If your advocacy efforts generate ten donations, you will receive one free entry into a UIndy Alumni Association event! You'll also receive a special social media shout out on the UIndy Alumni Association Facebook page. Take your advocacy to the next level! Advocates who generate 15 or more donations will receive an invitation to join President Robert Manuel at the Stadium Club for any 2017-2018 football game. You'll also receive a $25 gift card to the UIndy Bookstore! It’s time to celebrate the University of Indianapolis! Join us as we strive to reach 425 donors in 24 hours. Make a gift to support one of the following projects that provide students with hands-on learning opportunities at UIndy. The UIndy Alumni Association Board of Directors has offered a special challenge for UIndy Day. The first three projects to reach 50 donors will receive $1,000 from the Alumni Board. And the project with the most donors will earn an additional $1,000! Your gifts will help us provide more scholarships to students, strengthening our generous financial aid program. Scholarships support continued academic excellence and diversity, making a UIndy education accessible to any talented, qualified person who seeks it. Ninety-six percent of UIndy undergraduate students receive some form of financial aid. Your support could be the deciding factor for their future as a Greyhound. The Vandercook letterpress will be a game-changer for the UIndy Art & Design program, completing a full collection of presses. This student-operated re-setting and re-inking machine will be the catalyst for opening a new letterpress-only class and will allow students to complete complicated, technically-savvy projects on the professional level. Forward-thinking athletic trainers are redefining their roles in healthcare and patient outcomes through advances in technology. IPads will give UIndy athletic trainers information at their fingertips to enhance quality care for student-athletes. UIndy students work with real clients, using real money. Why shouldn’t they be using a professional analysis program? Morningstar Direct investment is a financial analysis platform used by leading industry professionals. It allows for hands-on, applied learning in the classroom, increasing our students’ competitiveness in the market. They talk. They turn blue. They hemorrhage. And they scream. These high-tech mannequins mimic human symptoms to prepare nursing students for what they will encounter in real hospital settings. Housed in the Simulation Center, these mannequins allow UIndy students to practice challenging clinical skills in a safe environment before working on real patients. Be sure to sign in or log in on the 'Advocates' tab and share your unique links to encourage your friends to support a project. 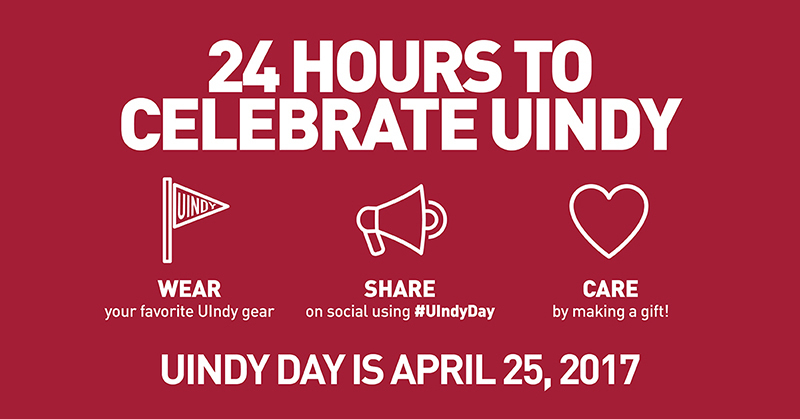 When you do, you could earn one of the many incentives for generating gifts on UIndy Day! Download graphics for your use on social media here.